Sydney Shop Girl: Tim Tams Really Do Grow On Trees. I knew it was going to be a magical day when I woke up this morning. And not only because I had a day pass from work to attend a conference in the city. Poncho - Missoni, dress- Veronika Maine, necklace - Red Phoenix Emporium, cuff - Hermes. The Universe directed me to the Missoni knit of my wardrobe and 5 minutes later I was dressed as per the photograph above. I've said it before and I'll say it again now. The Gilt Groupe do a mean invite only online sale. Ferocious in fact. The poncho fit perfectly and was the perfect thing to be draped in as I trotted along George Street with my fellow commuters this morning. Even the bus ride was perfect. Mr SSG and I relived our teenage years and shared a set of earbud earphones as we listened to my music on his iPhone. Everyone had a seat and we made excellent time for the morning peak hour. I had a spring in my step the moment I got off my bus. And walked into what looked like the start of a film set. 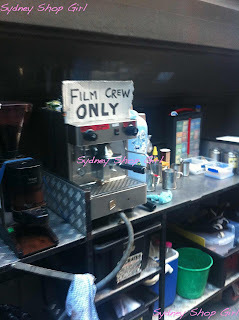 You know you're about to walk into something interesting in the Sydney CBD when you pass a film crew only espresso machine..... It's a law of big cities I picked up in New York City where you could be guaranteed a sighting of film crew vehicles any day you chose to walk the streets. The law was upheld when we reached Martin Place just before 8am and found the Truly Madly Tim Tam placards assembled along the steps. Looking up, I saw this tree with pretty lanterns hanging off it. What else could it be but a Tim Tam tree? 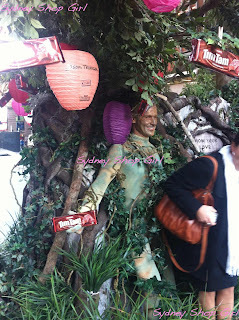 With family packets of Tim Tams pegged to its branches and an obliging Tim Tam tree person posing for photos. 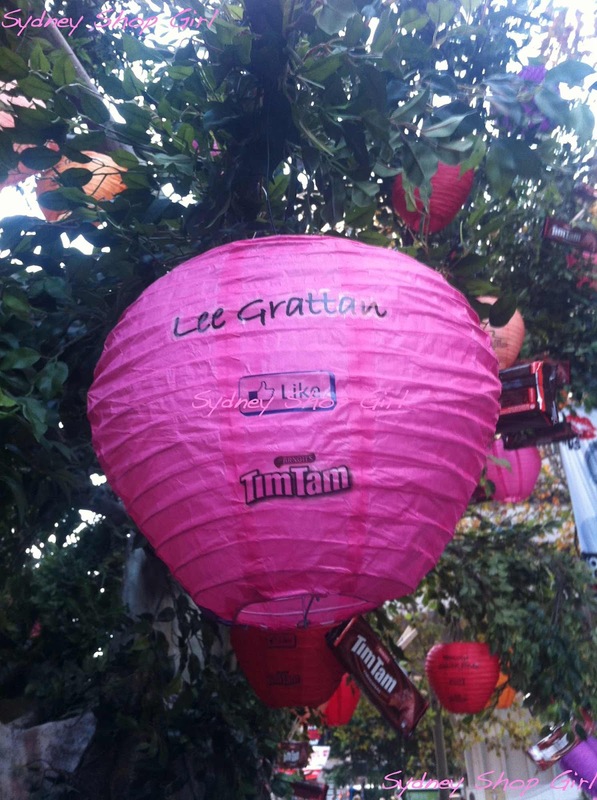 The lanterns were labelled with the names of Tim Tam Facebook fans who both like Tim Tams and wished for Tim Tams to 'grow on trees'. 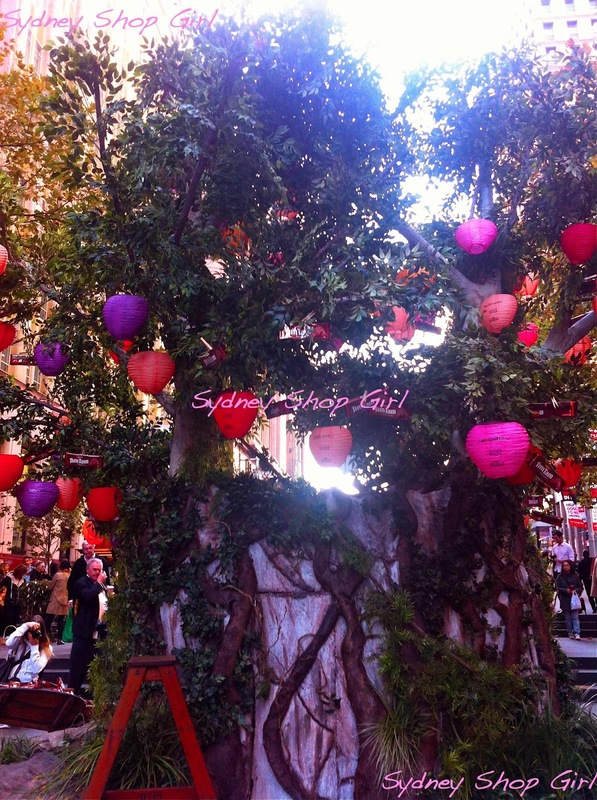 Their wish was granted today in Martin Place. Even the low lying shrubs were 'growing' single serve Tim Tams. 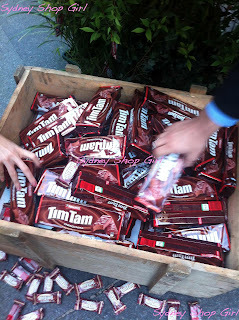 There wasn't a person in the city today who wasn't seen clutching a packet of Tim Tams or two as they went about their day. I even saw them on the bus home. Under the trees were bottomless crates of Tim Tams. 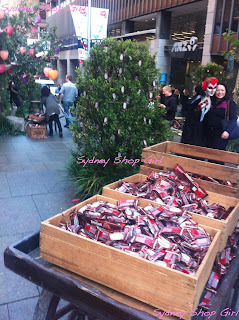 Which all of us passersby were doing our best to drain of their chocolaty treasures. 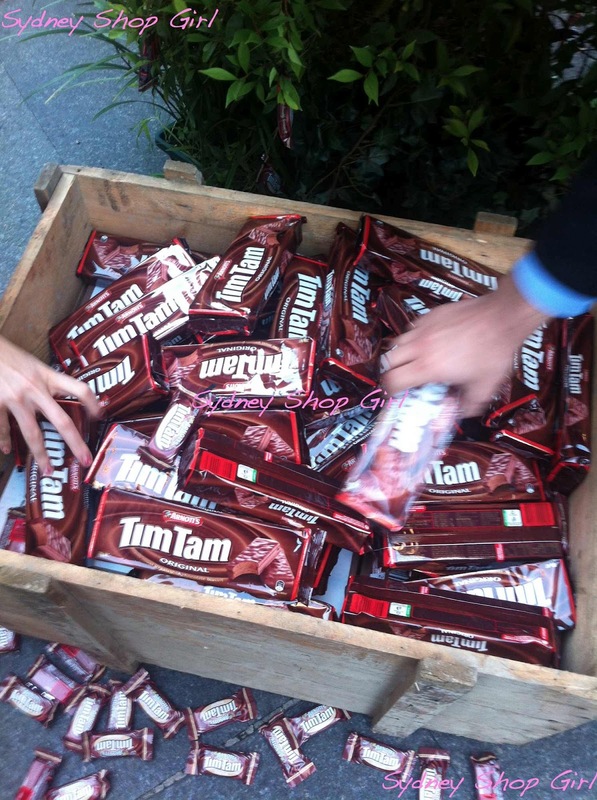 If that wasn't temptation enough, wood nymphs danced around the forest and distributed more packets of Australia's favourite chocolate coated biscuit. 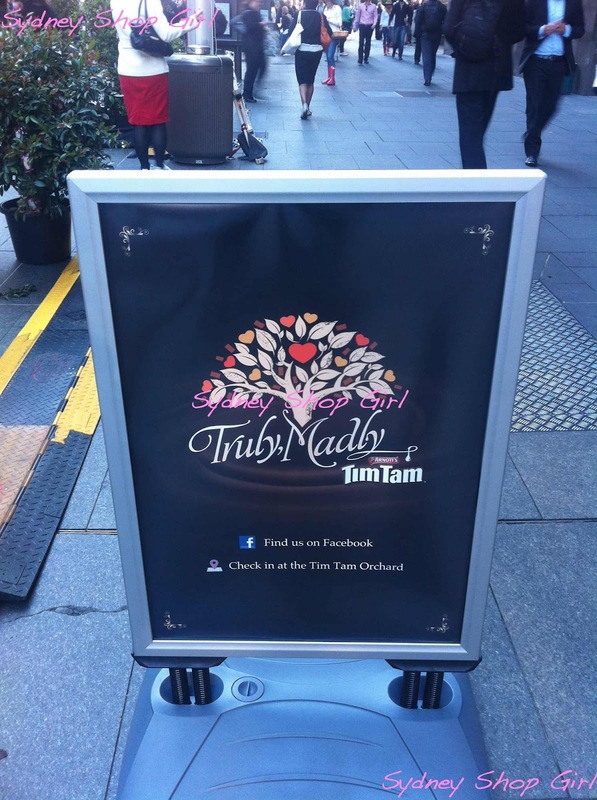 A film crew was on hand to film the public filming the Tim Tam tree. We all had to sign media waver statements and have head shots taken afterwards. I could be on TV!!!! In my Missoni via Gilt Groupe poncho!!!! 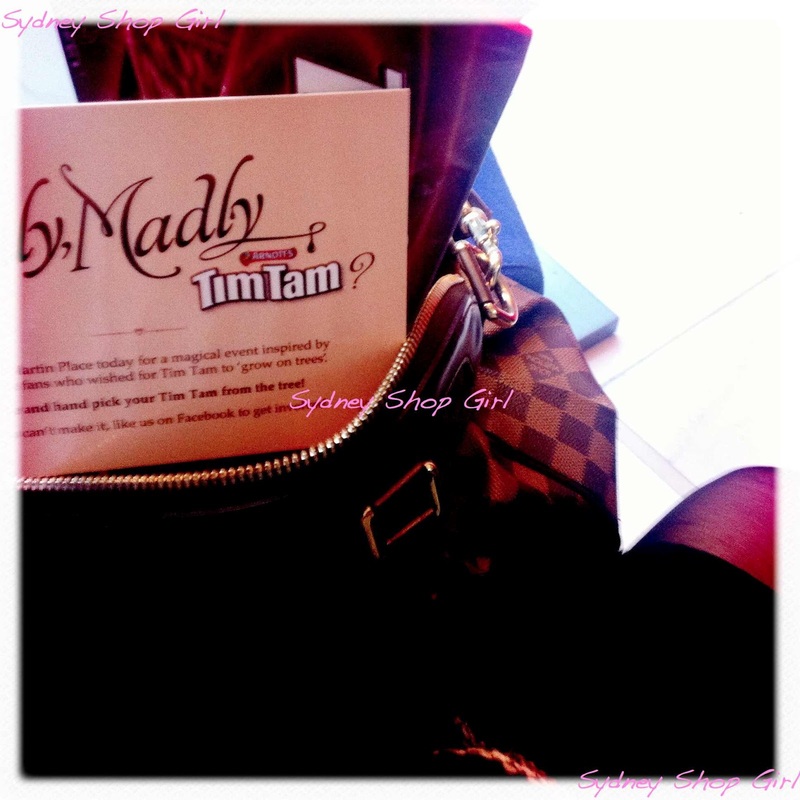 With a truck load of Tim Tams stuffed in my handbag. The new face of Tim Tams. I'm excited already. My haul of Tim Tams made their way safely home with me tonight but Mr SSG's were devoured by his work for morning tea. It was just one of those surreal mornings here in Sydney that make me realise just how much fun I have here without ever having to try too hard. And how today was a case in point about how you should never hit the streets here without a camera of some sort. 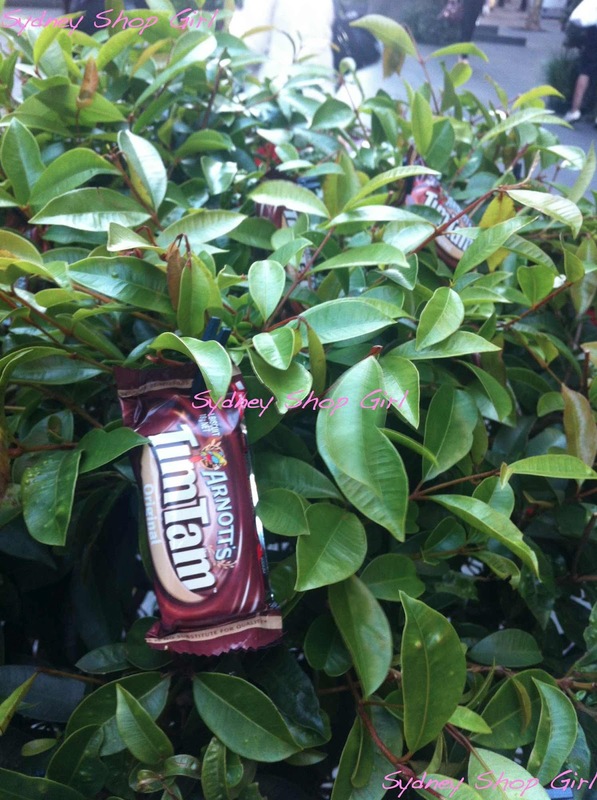 I wish for Tim Tam trees! That totally beats the time I was given a bunch of asparagus in Martin Place! What an awesome start to the day.